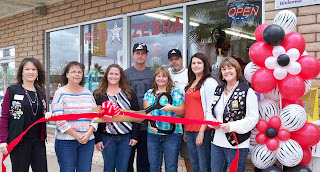 The Lake Havasu Area Chamber Ambassadors held a ribbon cutting ceremony celebrating the grand reopening and new ownership of the Red Zebra Boutique. Attending the ribbon cutting from left to right were Amy Sugamele, Jackie Lynden, Heidi Cothren, Chris Cothren, Dotty Sharp, Dave Sharp, Amber Coumparoules, and Kathie Schuler. Dotty Sharp, the new owner, is excited to be operating a business in Lake Havasu. New arrivals for spring and summer are available. The store will have a lower price point than in the past and will offer a wider selection of styles including plus size. For more information please contact Dotty at 928-846-3228.